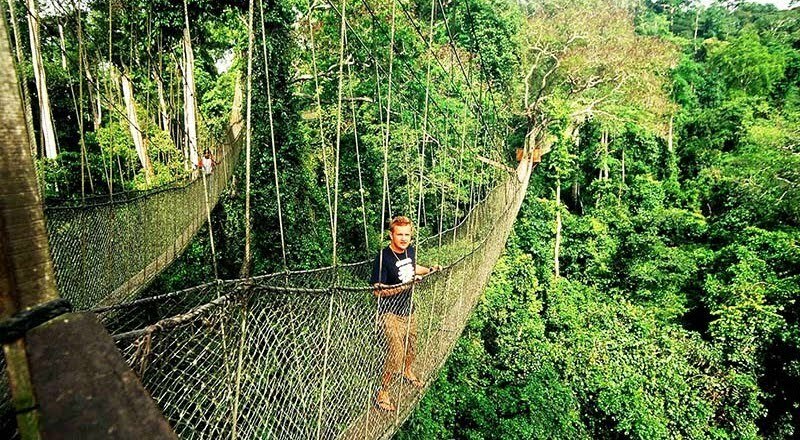 Kakum National Park & Canopy Walkway | Your Beach House in Ghana • Right at the ocean! Kakum national park’s most well known feature is its 333 meter long canopy walkway, suspended from more than 300 year old rain forest trees. Some are up to 27 meters (12 stories) above the forest floor. The view is breath-taking (and may be too much for visitors uncomfortable with heights). The canopy walk is only a hint of Kakum’s delights. It has a variety of trails and guided walks on which visitors can experience the rain forest and its wildlife. Kakum is a premier birding site, with 269 confirmed species, including 8 species of global conservation concern. Mammals include forest elephants, leopards, bongo’s, bush bucks and many other primate. However please note that game viewing is difficult. Furthermore; more than 400 butterfly species have been recorded. – Experience the canopy walk with a guide. – Enjoy a guided forest walk featuring information about the medicinal uses of forest plants. – Take a night hike with a park guide to experience sights and sounds of the forest during transition from day to night (must be arranged prior to day of visit). – Experience evening drumming and dancing by a local cultural group (must be arranged prior to day of visit). Kakum is a 30 minute drive from Cape Coast, on the Pedu junction road that passes through Abrafo. Kakum is conveniently close to Cape Coast and Elmina, where oldest European buildings south of the Sahara may be found: the over five hundred years’ oldest castles and forts that dot Ghana’s coastline. A few kilometers before reaching Kakum is the Hans Cottage Botel where visitor may observe and feed crocodiles in a large pound, with restaurant and bar built on stilts. Furthermore; the Cape Coast and Elmina municipalities have some of Ghana’s most colourful festivals. The Fetu celebrated in May in Cape Coast and the Bakatue of Elmina. Take the Accra - Cape Coast road. After Elmina junction continue for about 20 minutes to 'Ayensudo junction' (easiest is following the 'Kosa beach resort' signboards along the main Cape coast – Elmina road). Turn left. Take this road all the way to the village of Ampenyi. Take right when you enter the village (at the taxirank) until you almost meet the sea. Take right at the last house. You will see the limestone decorated outside wall of the beach house.